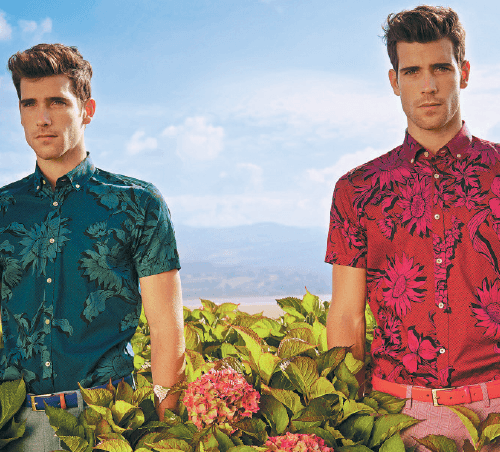 THIS season, Ted Baker brings you a dizzying selection of florals, bold prints, and colourful designs to usher in the coming of spring this year. Everything from menswear to accessories and bags are furnished with sequins, flowers, metallic prints and summery motifs. Whether it be its casual, sports or formal wear, you’ll find that burst of colour is the look Ted Baker is endorsing this season. Elegant dresses reflecting Mother Nature — flowers, leaves, pastels — are abundant. Menswear, on the other hand, features geometric motifs inspired by petals in shades of blue and green. I Love Lucy. Even shoes and bags feature flowers and polka dots on serene pastel shaded backgrounds. For the bolder men, the signature prints in camouflage and leopard — digitally printed will be something to look out for. Eye-catching and somewhat more “out there”, these suits and accessories are statement pieces for the daring. For everyone else, there are the usual dark or light coloured, classic suits that are perfect for every semi-formal occasion. Ted Baker’s casual wear for men this season embraces the look of relaxed layers — casual knitwear and smart pieces coloured in head-turning shades of the rainbow. Look forward to knitted sweaters, casual blazers and Bermuda khaki shorts embellished with once again, nature motifs. Ladies can look forward to 1970s style dresses with high necklines embellished with flowers and sequins, as well as miniskirts that are the must-buys this season. Called the spring/summer 2015 Phormal collection, it’s a range that combines polish and panache on a palette of candyfloss pinks, pastel mints and sky blues. In yet another touch inspired by Mother Nature, Ted Baker’s accessories — bags, shoes, belts, wallets — this season also play on the varying greenery — plants and flowers — around us. Even on its darkest coloured accessories, you will find lovely nature-inspired prints coloured in gold and other dreamy light colours. Handbags and shoes even come in matching colours; pink, blue, and white are all in the selection. Necklaces and bracelets also embrace Ted’s new floral theme, and these go along perfectly with the plain, pastel retro-style dresses — subtle with a touch of nature without becoming too overwhelming. Ted Baker outlets are located at Pavilion Kuala Lumpur, Bangsar Village II, and Suria KLCC. This article first appeared in The Edge Financial Daily, on March 24, 2015.